Explicitly creating instances of FormGroup and FormControl classes using the new keyword. 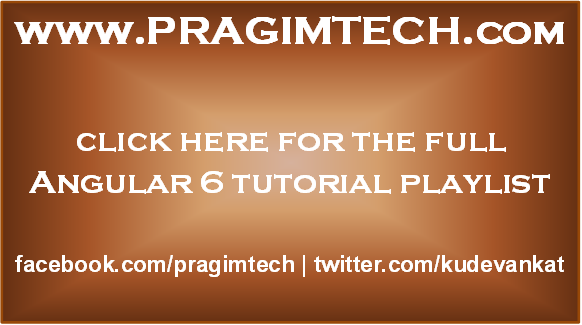 We discussed this in Part 4 and Part 6 of Angular 6 tutorial. We will discuss FormArrays in our upcoming videos. Notice in the example below, we are using the FormBuilder group() method to create a FormGroup instance. To the method we pass an object that contains a collection of child controls. For each child control we specify a key and value. Key is the name of the form control and the value is an array. The first element of the array is used to specify an initial value for the form control. The second and third elements of the array are used to specify synchronous and asynchronous validators for the form control. We will discuss these when we discuss form validation in our upcoming videos. For now, we have defined just the initial value using the first element of the array. We have specified an empty string as the default value for all the controls except proficiency radio buttons. For proficiency we have a default value of beginner. So the respective radio button is selected when the form loads. FormBuilder reduces the amount of boilerplate code we have to write to build complex reactive forms. Would it be possible to get a code download for each section as completed? I am having different results and can't find my error.